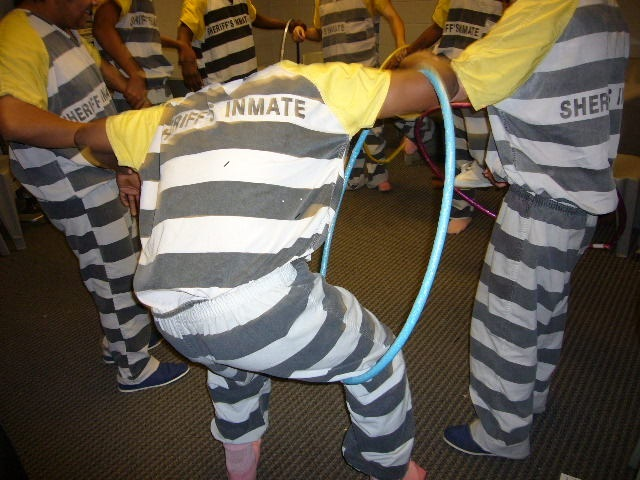 Goals: Teach detained and/or incarcerated youth and young adults valuable life skills focusing on dealing with cultural diversity, peer pressure, bullying and anger management skills. Share with the community a message stressing decreased violence of all types. Introduce new and fresh perspectives thought the creative process. This program provides and demonstrates endless possibilities and options for the individual through the experiential creative process of whole-brain thinking. Awakening creative consciousness exposes the individual to the unlimited potential of critical thinking, problem solving, and self-empowerment. This "awakening" empowers the individual to explore new possibilities and purposes that leads to improved life skills and becoming a productive community member. Without these critical life skills, the still-maturing minds of our youth may view their future as bleak and "set in stone" with little hope for a “normal” life. At the end of the 3-day workshop, participants create a group painting to present to the public. This is an "expression" created by workshop participants from a creative array of personal perspectives that is often quite harmonious and unifying. The group painting is the culmination and pinnacle of the experiences they have drawn from the program.At the end of the 3-day workshop, as the culmination and pinnacle of their experiences drawn from the program, participants create a group painting to present to the public; an expression created by persons from multiple perspectives can be harmonious and unifying. Who Am I? Objective: to understand cultural diversity, how much everyone has in common yet often make the mistake of “judging a book by its cover”. Seeing Beyond Objective: to have participants use their senses to describe and identify an object, stimulating the sense of touch, smell, and intuitive sense using new descriptive words: translucent, opaque, sphere, and cylinder shape. Through the Hoops Objective: learn to work as a team and identify the skills of self and others. Knowing how to ask for help when needed; if you see others that demonstrate a skill you believe will help achieve your dreams, ask for help while linking up and passing hoops from participant to participant. Drawing Our Memories, Fears, Hopes, and Dreams Objective: Understand the concept of drawing as a means to communicate feelings and ideas. Overcome doubts and recognize fears, then achieve your dreams by listening to yourself rather than others. By sharing these drawings with the group, the participants become aware that they are not alone and will often openly discuss their hopes and dreams to the group. Color Objective: to see color through music and experience how color can affect mood and express feelings. Group Painting Objective: to understand the concept of using teamwork, respectful feedback, and learning how to show appreciation all while learning to accentuate and not desecrate. The finished painting is a symbol of what they are capable of achieving as a community. "This expresses our support and interest in working with Release the Fear (RTF) on the Bridging Possibilities project for participants at the Durango and Mesa SEF Juvenile Detention Centers. We have been impressed with the work of RTF in the past, as our youth are taught new ways of dealing with conflict and anger – healthy ways of expressing themselves such that they do not re-offend, and can lead productive lives, contributing to their communities. Through the creative process, our youth have seen that art can be wonderful tool for them, and they have gained a better understanding of themselves and their peers. We are eager to continue work with RTF so that our youth can turn their pain into possibilities and purpose!"